The following article is the full version of something I recently published on the Campaign for the Public University website, which you can find here. It is basically a summary and critique of the market reforms to Higher Education, with reference to the main literature with a focus on political economy. ‘Human progress is neither automatic nor inevitable. Even a superficial look at history reveals that no social advance rolls in on the wheels inevitability. Every step towards the goal of justice requires sacrifice, suffering, and struggle; the tireless exertions and passionate concern of dedicated individuals. Without persistent effort, time itself becomes an ally of the insurgent and primitive forces of irrational emotionalism and social destruction. This is no time for apathy or complacency. This is a time for vigorous and positive action.’ – Martin Luther King, Jr. The situation looks bad in higher education today (if you are not a believer in neo-liberalism that is). This article does not wish to add to the depression that is leading to more and more apathy on the part of academics, higher education workers and students, reinforcing the common sense of the status quo that ‘there is no alternative’. I believe that the possibility of change and of a reinvigorated fight is on the horizon, specifically in the coming year building up to the 2015 elections. After three years of £9000 tuition fees and income-contingent loans, the evidence is now showing that the Coalition’s neo-liberal experiment has failed: the cuts and subsequent attempts to bring market efficiency into higher education in England will cost the government more than the system it sought to replace. On top of this, the evidence concerning for-profit providers in the US points to inefficiencies, declining quality and huge student drop-out rates. Furthermore, the ideology of “no alternatives” will not stand: in Germany strong student, union and political collaboration has overturned similar attempts to turn higher education into a market, and now all federal states have abolished tuition fees and re-established higher education as a public good, free for all (including international students). There is much work to do, and first we must understand what has happened so we can understand what to do next, and be able to win important arguments. What follows is a summary of the situation concerning tuition fees and student loans, which relies heavily on some excellent work done by a handful of brave scholars. Hopefully I will have shown by the end that although the situation is complicated, it can be understood and a vantage point for action can be achieved. There reasons for hope, practical and immediate things to be done, and I outline these at the end. 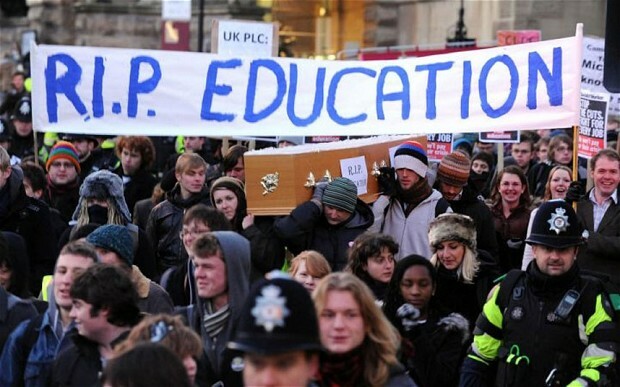 Tuition fees were first introduced by the Labour government in 1998, initially at £1000 a year, in response to recommendations made by the 1997 Dearing Report, which suggested that students should contribute to the costs of university education. In their second term in government, Labour increased tuition fees to £3000, inaugurating a tradition of back-tracking on election promises concerning tuition fees – Labour had stated in their 2001 General Election manifesto that ‘Labour will not introduce top-up fees and has legislated against them’. Interestingly, the Conservatives were at that time completely opposed to tuition fees, with Iain Duncan Smith condemning them as a ‘tax on learning’. The Queen even stated in her 2003 speech that ‘up-front tuition fees would be abolished for all full-time students’. Despite all this opposition, the Labour government managed to pass the higher education bill with top-up fees on January 27 2004, with a majority of just five votes. One of the concessions made to Tory backbench opposition to top-fees at the time was a full independent review on the higher education situation, undertaken by Lord Brown (then Chairman of British Petroleum). The Browne Review, published in 2010, recommended lifting the cap on tuition fees altogether, again caused great controversy in parliament, in the media and on the streets of Britain with mass protests from students and academics. Nevertheless, the Coalition (barely) won the vote in the House of Commons resulting in universities being able to charge up to £9000 a year in tuition fees, supported by access to inflation-linked and income contingent (ICR) student loans, underwritten by the government. The larger economic background for the increase in tuition fees was as a measure to mitigate the damage caused by the financial crisis of 2007-8 (and alleged Labour government public spending) – the increase in tuition fees was matched with a cut to block grants issued to universities, the former meeting the loss of income caused by the latter. For the government, higher education funded by fees instead of grants meant that the economic burden of public spending could be displaced – the actual spending of grants was transformed into assets (the “deficit” is calculated by what the government owns, including what it is owed, i.e. assets, versus what it owes, the Public Sector Net Debt) which would be recouped in the future. On top of this, to make the loans system attractive (and acceptable to the Liberal Democrats, who had promised no rise in tuition fees), the government set the repayment threshold at £21,000 (first repayments beginning in 2015), which would rise with inflation, and also to write off any debts that weren’t paid back after 30 years. This allowed the government to claim that the loans system was progressive. The issue of the cost of loans that will be written off is becoming central to the debates on the success or failure of the reforms to higher education – the “gamble” (as Andrew McGettigan calls it) of the reforms was that even after an estimated 30% of all loans are written off (after 30 years), the government would save £1billion for the reduction of the deficit. However, recent estimations, 3 years on, have revised this figure to 45%, ‘all but nullifying any savings to the public purse’. London Economics have predicted that if the write-off exceeds 48.6% then the cost of the reforms will exceed the cost of the system it replaced. The major issue with the gamble that the Coalition are making with higher education is that the financial viability of the whole scheme rests on predictions on the future earnings of graduates and the growth and health of the British economy, neither of which are certain. A report by the Institute for Fiscal Studies, commissioned by Universities UK, admitted that ‘our earnings simulations are not predictions of the future; they are instead simulations based on a series of assumptions’. As Andrew McGettigan predicted in 2013 in his indispensible book on the Coalition reforms to higher education, The Great University Gamble, ‘governments are not going to allow the build up of potential long run problems’. McGettigan predicted that the government would freeze the £21,000 repayment threshold, which they have now done, thus breaking the promise made to Coalition partners the Liberal Democrats that the threshold would rise with inflation. McGettigan also predicted that the government would continue attempts to sell off the student loans book (that is the ownership and backing of the loans taken altogether, now and in the future) – the government has already successfully sold off the pre-1998 mortgage style loans, accepting a loss of £140 million overall through subsidies paid to third parties (subsidiaries and consortiums of Natwest, Nationwide Building Society and Deutsche Bank AG). These subsidiaries were necessary in order to make the loans attractive to private interests – the whole problem centres on the management of risk. The government are prepared to lose money in order to get rid of the risk posed by loans, and the risk of these loans must be made worthwhile to businesses such as banks and building societies (whose profits are generated by successful calculations of risk). The government has so far failed to “sell” the risk of the post-1998 income contingent loans, despite many attempts to do so. According to McGettigan, there may be a fundamental flaw in the plans to sell off the ICR loans: a lack of history and datasets mean that investors are unable to price them with any confidence; any discount or subsidy to make the loan book attractive to investors would be so large (the loan book is growing by £10 billion a year) that it would no longer represent ‘value for money’ for the tax payer. Plus any attempt to sell the low-risk loans (doctors or Oxbridge graduates perhaps) would leave the government with the rump of non-repayment risk, thus defeating the object of the sale (McGettigan 2013: 183). This is why the recent suggestion by David Willetts, now ex-Universities Minister, that universities should be able to underwrite, or effectively buy, their own students’ loans is not a serious solution to the growing problem of un-paid loans for the economy. It would only be the richest universities (Oxford and Cambridge, and perhaps some Russell Group) that could afford the risk, and this would still leave the risk generated by the majority of loans from students attending non-elite universities. Furthermore, these non-elite (mostly post-1992) universities are already at risk of becoming unviable through the new reforms, and any gambles they make with their own income-vs-debts calculations could result in further sanctions from the government, who have stated in the White Paper of 2011, Students at the Heart of the System, that ‘it is not Government’s role to protect an unviable institution’. Future government plans include reforms to the laws on governance of universities, allowing fully-private institutions to enter the market, and even to buy out any universities that become unviable. These universities just can’t afford to take on any more financial risk. Additionally, Labour’s proposal to cut the tuition fees to £6000 a year if they win the coming election is not only unrealistic, considering they don’t seem to have a plan as to where the money lost to universities (who now all charge the maximum) would come from, but also hides the fact that they were the ones who initiated this revolution in higher education funding. It was Labour who brought in the 2008 Sale of Student Loans legislation (which also allows the government to increase the interest rates of loans without consultation. And it was Labour who in late 2009 ‘decided to seek specialist financial advice about ‘alternative routes to market’ – resulting in a tender document published in April 2010 outlining ‘options for a potential sale of it existing £25 billion income-contingent student loan portfolio’ (McGettigan 2013: 181). The Higher Education Bill 201-? Well, it seems that in the long term the government might have no option but to try to convince us to get rid of the “progressive” policy to write off unpaid loans. Meanwhile, in the short term, they can change the terms and conditions of the loans, increasing the interest rates to “market rates”. They can do this because of a clause that appears in the Student Loans: A Guide to Terms and Conditions, which states that “you must agree to repay your loan in line with the regulations that apply at the time the repayments are due and as they are amended. The regulations may be replaced by later regulations.’ This clause was made possible thanks to the Education Act of 2011, which was supposed to be more concerned with Further Education, but which the government used to sneak in more ‘quick and dirty’ secondary legislation. It is extremely important that students know about this clause, and of the government’s plans to (unsuccessfully) sell off their loans. I think that even though students could be blamed for not ‘reading the small print’ and not following all policy decisions that relate to them with a keen interest, students would nevertheless, legitimately in my opinion, see these moves as a betrayal of trust. The government is supposed to be there to protect our social and personal interests, and I imagine that many students reluctantly sign the loan agreements because they are public loans, not loans owned by banks and building societies who regularly perform such financial ‘sleights of hand’ to gain a quick buck here and there. It is our duty as academics and higher education workers to muck in with the students against the reforms and also to get stuck into the public sphere. We must firstly understand the economic and political policies that the government are trying their best to push in through the proverbial back door, and then to explain these policies to other academics, higher education workers and students as part of a general movement of protest and campaigning. If the government manage to scrap the unpaid loan write-offs it will be down to our own incompetence and inertia as much as the evil scheming of our neo-liberal ruling classes. As McGettigan warns, the Coalition’s real plan could be to ‘sell a generous loan scheme to the public, Coalition partners and Parliament, only to make it far less generous when its lack of viability becomes apparent. In this way a scheme that would not have got approval in one go is achieved in two bounds’ (McGettigan 2013: 173). This is correct – there is no way that the Coalition would have got a tuition fee system based on uncapped maximums and private loans, basically the US system, through parliament back in 2011. The key problem that the Coalition, or subsequent government also trying to push market reforms to higher education through, is that at some point a major piece of primary legislation will need to be put together, in the form of a Higher Education Bill (which has been promised for some time but delayed until it looks likely the things that the Coalition want to put in there will get through parliament). In the White Paper of 2011, it is stated that primary legislation is needed to be able to open up degree awarding powers to private providers like Edexcel. This is a significant proposal that needs to be covered in more detail elsewhere, but is designed to allow teaching-only institutions to come into the higher education “market” with reduced costs and able to offer cheaper fees. Of course this can only result in redundancies (both of academic staff and whole degree courses) and increasing casualisation (i.e. more zero-hours contracts), not to mention the danger of sub-prime degrees (i.e. ‘cheap and cheerful’, but unregulated, degrees). Primary legislation takes a long time to go through parliament, which provides ample opportunity for mass protest and campaigning by informed academics, higher education staff and students – so it is an understanding of issues such as this, as well as problems with and alternatives to the tuition fee system, that could prove crucial in rejecting any ideological or frankly dangerous “clauses” in the inevitable Higher Education Bill. Whether the reforms are in fact a shamble or a shrewd manoeuvre to introduce a market into higher education is hard to say for sure (although a critical overview of the whole project would suggest the latter), but as mentioned before, the government might try to bulldoze UK higher education into accepting US style full privatisation as the only way to solve the looming “black hole” of tuition fee debt. This of course will take the form of familiar austerity ideology of necessary measures to save the economy, but there may be darker inflections to come as a result of this coming crisis stage of the reforms. One unexpected (or perhaps not so unexpected) bonus for the government of “financialising” undergraduate degrees, which is to say seeing them solely in terms of their economic value, is that the performance, or value, of individual institutions, even individual degree programmes, can be measured using data from students’ subsequent abilities to pay back particular loans. In effect, the government will be able to decide how much a university or subject contributes to the economy through graduates’ post-university careers. More than that, universities can then be punished for underperforming, with the probable result that economically inefficient subject will be culled (much like Philosophy was at London Metropolitan). Even darker perhaps we might see the disciplinary Tory discourse of “scroungers” redirected at students who don’t manage to get higher paid jobs after graduating. Here we can see the ugly side of neoliberal ideology when it comes into contact with British conservativism – it is people’s own fault if they are poor. This can be then combined with the above disciplining of universities to stigmatise certain universities as underperforming due to lack of effort, or in management-business speak, inefficiencies (i.e. paying staff a decent wage). This is ideology because it hides the real reason why students can’t get a good job after graduating – because Margaret Thatcher (with variations on a theme after her) gambled on the UK’s emerging post-industrial economy, ‘in which money could be made without making anything else.’ Now graduates can look forward to either chasing money in financial jobs in London, or design new ways of making money for other people and selling people things they don’t really want in marketing jobs (unless they can afford to embark on an unpaid internship of course). If market reforms go ahead, the post-1992 universities will struggle to compete with the new private provisions who only need 1000 students to be called a university, and have no commitment to research (or employing expensive academics). The future might look bleak, but only if we lie down and take it. We have damning data from the US, who have always had a tuition fee system with no caps and have a market system with both public and private (and a whole mixture in between) institutions in competition with each other. In 2012-13, the average cost of annual tuition in the United States ranged from $3,131 for public two-year institutions (community colleges) to $29,056 for private four-year institutions. In 2012 Senator Tom Harkin released a report on an in-depth two-year investigation into 30 for-profit US universities (institutions that have shareholders who are able to extract profits from the institution, as opposed to private charitable institutions that cannot distribute profits in this way), which found that large numbers of students fail to gain any credentials, there is a 64% average drop-out rate at such institutions and there is often a relatively little amount of money spent on instruction – 22.4% on marketing and advertising, 19.4% on profit distributions and only 17.7% on instruction. According to McGettigan (2013: 4), the evidence from the UK reforms already points to investment in non-teaching facilities that will attract students: marketing and recruitment, sports and leisure centres, social facilities and ‘landscaped campuses’. The things that will be termed “inefficiencies” will no doubt be teaching staff and permanent contracts. Furthermore, in 2011 the US higher education system was worse value for money than the UK grant-funded system. According to Howard Hotson, the fact that the US regularly has more universities in the top world rankings is misleading – the US is much larger than the UK, and proportionally the UK universities in the top rankings are larger than their US counterparts. Basically, if we divide the number of top universities for each country by its population, the US drops to 14th place on the international league table of university systems. If we then divide the number of universities by each country’s GDP (Gross Domestic Product), the US stays at 14th. Worse than that, if we divide the number of universities by total spending on higher education for each country, then the US drops to 16th out of 20 – the US spends more on higher education than any other country. Using the same calculations, UK higher education (remember we are talking about the pre-reform model, with public funding via grants) rises to 3rd place overall. Even better, when we look at the value for public spending, the UK offers 50% better value than its nearest competitor. On top of these statistics there have been a number of scandals in recent years, such as the Goldman Sachs “hypergrowth”-inducing takeover of the Education Management Corporation in which recruitment officers were ‘were encouraged to admit anyone with a pulse, including ‘applicants who are unable to write coherently, applicants who appear to be under the influence of drugs, and applicants for EDMC’s online program who do not own computers’. But perhaps more importantly, we have a positive case study in which market reforms were overturned in Germany in the interest of returning higher education to a public good. In 2005, despite a federal law banning tuition fees, the Federal Court in Karlsruhe ruled that moderate fees complemented by affordable loans wouldn’t contradict these laws. Within two years many federal German states followed suit, worried that their institutions would suffer if they didn’t introduce the reforms. By 2007, seven out of 10 western states had introduced fees. But now, against all odds, the reforms have been completely overturned, with the last state Lower Saxony abolishing tuition fees this month (October 2014). How did this happen? Howard Hotson puts in down to democracy: ‘In Hesse, for instance, students protested en masse, a citizens’ initiative collected 70,000 signatures, and the ruling Christian Democratic Union party, fighting for re-election in 2008, reversed course in order to retain power’. Crucially for us, being at the beginning of such a long and hard fight, an Alliance Against Tuition Fees was formed from 200 organisations, including students’ unions, trade unions and political parties, who pushed for a referendum and got a petition signed by 1.35 million voters. The German case clearly suggests that we need to work towards a counter-hegemonic popular movement against the marketisation of higher education, focussed in the short term around tuition fees. The success of the German Free Education Movement is an important point of hope and a powerful ideological weapon against the nihilistic “no alternative” narrative of neoliberalism (endorsed by both the Coalition and Labour). Simplistically we have an example showing that public funding can work (adding Scandinavia as well), not only that but that marketisation can be undone if rejected early enough on – and in Britain that means before any primary legislation in the form of a Higher Education Act is passed through parliament. We also have a model of how a successful movement works: academics, higher education workers, unions and politicians working together. There is a march organised by the Student Assembly Against Austerity in London on the 19th November: we should support this and help the student movement grow again. We can specifically learn from the German success story that politicians do respond to public opinion when it becomes an ‘irresisyable force’. It seems to me that politically, the first job is to get rid of the Coalition, and then force Labour to put something far more radical on the table, and make it clear that if they go back on their promises, we’ll kick them out of parliament. There is also have mounting evidence from the US that for-profit higher education is a bad idea: money being spent on anything but quality education, depressing fail rates and generally sub-prime provision. The campaign against tuition fees must be placed within a general and effective critique of the marketisation of higher education. Andrew McGettigan has undertaken the admirable and thankless task of interpreting and explaining the obscure and clandestine reforms of the Coalition through his self-styled Public Interest Higher Education Journalism (with a focus on finance) – when we win the war against marketisation in higher education then it will be largely thanks to him. We need more McGettigans but also more academics that are prepared to understand the reforms to be able to explain the dangers in an accessible and concrete way to students and colleagues (and anyone else who will listen), and to put the changes into a convincing bigger counter-narrative to neoliberalism. We need hope. Academics are good at criticising but not at putting forward concrete alternative or strategies for action. We need to immerse ourselves in the public sphere, writing for publications with a wider readership than our journals (for example on collaborative blogs, The Conversation, online newspapers), speaking on television and radio, speaking at open meetings, speaking at teach-ins and occupations (if we can get away with it). We need to put together a winning, convincing and economically viable argument for higher education as a public good.